When I read about school committees cutting music, art, sports, and skill-building programs to make room for more math and science classes, I groan inwardly at the thought of how we teach our kids to live conceptual lives in a conceptualized world, as if the world of detailed sensory-motor experience didn’t matter or even exist. As if test scores and right answers are the measures of a good education, not experience, engagement, fascination, or enjoyment. We teach our kids to “know” what a small, select segment of the adult population already knows, not to lead their own lives and draw their own conclusions from their streams of unique experience. We train for entry-level jobs in favored industries as if we could tell the future, not for leading a life in unpredictable times, which would be closer to what is likely to happen. As once we trained farm girls to tend whirling spindles in textile mills through New England, jobs that no longer exist because we have automated them and shipped them overseas. This is exactly parallel to our reaching out to new experience from the vantage of where we’ve already been, rather than taking pains to explore what is presently before us. Projecting our remembrances onto the now, seeing in terms of the past—how does that serve as adequate preparation for welcoming a future we cannot predict in advance? We know that Steve Jobs would have been a misfit in the days of James Watt, Thomas Edison, or Henry Ford. We need to help our children live in a world we cannot see from where we stand today. The task facing every generation is to learn to be open to possibilities raised by novel situations, today and forever. If we insist on clamping what we already know now onto the minds of the young, condemning them to relive the lives their teachers have already lived, how are they going to find the essential freedom, imagination, skills, and curiosity to lead lives of their own in their own times? In truth, education must allow for a high degree of uncertainty in how it is to be put to use. Its goal must ever be teaching the young to experience and to think for themselves in the many unknown situations they will surely face. Some of those situations will be similar to the ones we have known, but they will also differ in many respects. Heading into the unknown with resources that can be brought to bear no matter what, that is the gift of the true education we owe to our children. Making them into copies of employees we need today in our workplaces—that condemns them to a life of frustration and inadequacy in falling short of becoming their own unique selves. 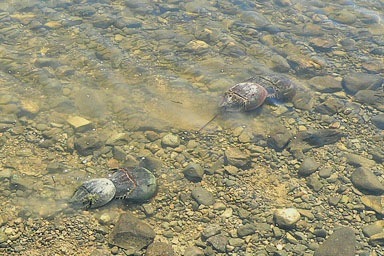 On May 19th, I saw the northernmost population of horseshoe crabs on Earth at it again. 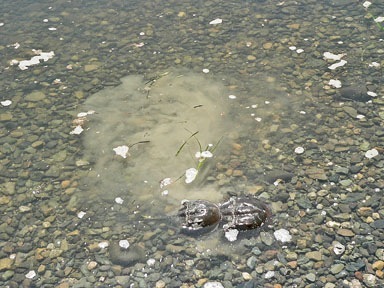 Every spring I go looking for them on their breeding shores, and every spring I catch them in the act. Only, now it’s in May, not June, because the water is warmer than it used to be. Their ritual has become my ritual. Spring wouldn’t come if I didn’t join in their celebration of water temperatures rising to 13 degrees Celsius. When it reaches that point, they come ashore to dig nests in what sand they can find, fertilize the eggs, and bury them safe from predators such as striped killifish, which lie in wait for the protein in those eggs. I, too, lie in wait, not for protein but to take my annual photographs of this fertility rite that has been continuing unbroken for some 400-million years. I am not that old, but I celebrate their presence in the bay as a reminder of not only their longevity, but of their finding a niche in the universe that has worked for them all that time. My ongoing loop of engagement with horseshoe crabs is a sign of my respect for their evolutionary success. They still look the same as they did before Pangaea split up, well before the great reptiles became extinct. 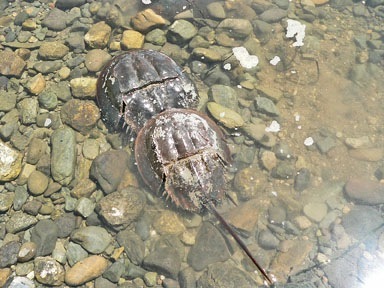 We have much to learn from the horseshoe crab. Here are three photos from May 19th. The first shows one pair of the 34 crabs I saw on that day. They are swimming along in their breeding position, female in front (toward the top), male grasping the trailing edge of her shell, a position from which he will fertilize the eggs she lays in her succession of perhaps six nests. The second photo shows a pair emerging from the plume of mud she stirred up in testing the bottom to see if it was suitable for digging a nest. The third photo shows how protectively camouflaged two pairs swimming along the bottom appear among the cobbles and small boulders of their chosen habitat. The males appears light because of the coat of mud they picked up burrowing into the soft bottom. This is one of my spring engagements, along with teaching Consciousness: The Seminar; giving a talk on An Anatomy of Consciousness; connecting the dots for 350.org to mark the site of shoreland erosion and sea-level rise in Acadia National Park; promoting an amendment to the U.S. Constitution to counter the impact of the “Citizens United” Supreme Court decision; supporting Occupy Mount Desert Island; and so on. Horseshoe crabs model the secret of a long and happy life—Stay Engaged!